Aryl polyenes are yellow pigments produced by bacteria living in widely varying environments such as soil, the human intestines or other ecological niches. Embedded in the membrane of the bacteria, they serve as protection against oxidative stress or reactive oxygen species. The latter can damage the cells once it enters the bacterial cell. 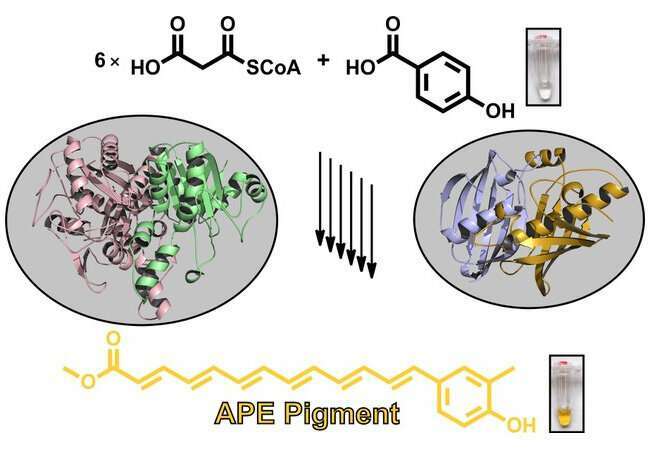 "Aryl polyenes' anti-oxidative properties are similar to those of carotenoids, but are produced completely differently," says Gina Grammbitter, who investigated this system as part of her doctoral work. "Its biosynthesis is very similar to the formation of fatty acids, but also exhibits unexpected differences," adds Nina Morgner. "Together with Michael Groll's group, we were able to identify unusual complexes of the proteins involved and determine their structure." As the researchers demonstrate in the current issue of the Journal of the American Chemical Society, aryl polyenes are produced via a novel biosynthesis pathway and are presumably located directly in the membrane of the bacteria. However, aryl polyenes are only part of a much larger natural product: "What's still missing is the formation and structure of this overall structure," explains Gina Grammbitter, who is currently working on exactly this issue.